Pope Wines & Liquors is a family owned and operated store since 1965. 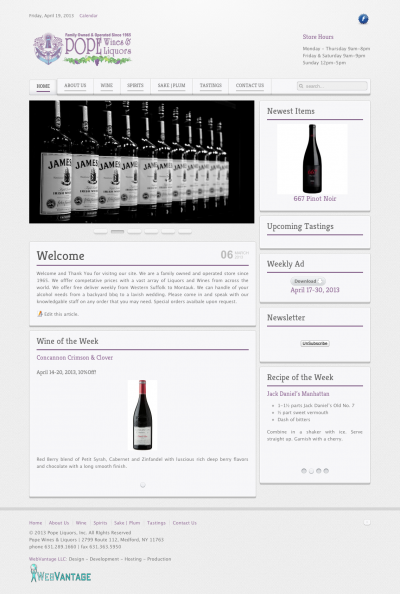 We offfer competative prices with a vast array of Liquors and Wines from across the world. We offer free deliver weekly from Western Suffolk to Montauk. We can handle of your alcohol needs from a backyard bbq to a lavish wedding. Please come in and speak with our knowledgable staff on any order that you may need. Special orders avaibale upon request. We recently upgradd their website to Joomla! 3.4. Joomla! 2.5, Logo Design, Calendar, Advanced Contact Forms with CAPTCHA, Social Bookmarks, WidgetKit, Zoo Product Catalog, Document Downloads, Newsletters and more! "Excellent service. Great web support."